On 9th July, 1947, Yeoman Frank Ryman (U.S. Coastguard) sighted an unusual object in the skies over Lake City, a northern suburb of Seattle. Ryman estimated the object to be flying at 500 m.p.h. 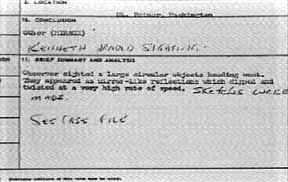 and at an altitude of 10,000 ft.
Kenneth Arnold's official report of a UFO sighting that would change the course of history. On Wednesday 2nd July the Wilmot family were relaxing on their veranda in Roswell . Just before 10p.m. they saw a bright ,glowing ,oval object flying at high speed to the north-east. 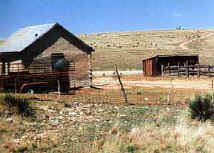 The Foster Ranch house [ left ] Mac Brazel's home. Note the barn where some of the debris was stored overnight. On Friday 4th July at 11-15p.m. 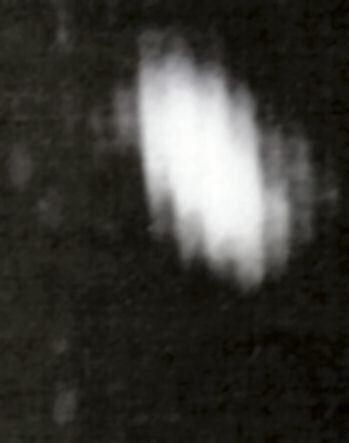 the nuns of St. Mary's Hospital in Roswell saw a flaming object coming down in a curve to the north of Roswell. William Woody and his father also saw the object from their ranch to the south of Roswell .Meanwhile 75 miles north-west of Roswell during a raging thunderstorm Mac Brazel ( foreman of the Foster ranch) and his neighbours hear an explosion. Out in the open countryside two campers, Jim Ragsdale and his girlfriend, observe the crash of a bright object whilst sheltering from the storm. First thing on Saturday 5th July Mac Brazel and William "Dee" Proctor (the seven year old son of a neighbour) ride out to check for storm damage. They come across an area about 200 yards by 3/4 mile long covered in wreckage including a metallic foil-like material and rods like balsa wood with strange hieroglyphic type writing on them. When crumpled and released the foil-like material quickly regained its original shape and the rods were impervious to cutting or burning. The exact spot where the crashed UFO was found. Mac Brazel - he found the wreckage of crashed UFO and lived to regret the day he reported it to the authorities! By chance Frank Joyce , a reporter with Radio K.G.F.L., called Wilcox and the sheriff put him onto Brazel. Joyce is the first person to announce the news and suggests that Wilcox contacts Roswell Air force Base. Wilcox talked to Intelligence Officer Major Jesse Marcel who collected the fragments of wreckage and returned to base. He was then ordered by Col. Blanchard to go to Brazels ranch accompanied by a captain in the C.I.C. Blanchard then notified Brig. Gen. Roger Ramey who immediately informed the Pentagon. In mid-afternoon Chief of staff Col. Thomas Jefferson Dubose was called by Gen. Clements McMullen (deputy Commander of Strategic Air Command) from the Pentagon who ordered that the wreckage be flown immediately to Andrews Air Field near Washington. McMullen collected it personally and sent it to Brig. Gen. Benjamin Chidlaw - deputy Commander of the Air Technical Intelligence Corps. at Wright Field. Marcel and the C.I.C. agent (a captain) then traveled with Brazel to the Foster ranch arriving there at about 8-00p.m. . Brazel showed Marcel the wreckage in his shed - there was no excessive radioactivity detected by Marcel. The three men slept at the ranch unawares that an aerial search for the wreckage had already begun on orders from the Pentagon. The aerial search located the wreck and its occupants 40 miles north-west of Roswell. A salvage team dispatched to the site came across a group of archaeologists (led by W.Curry Holden) who had accidentally come across the site whilst searching for pre- Columbian Indian pottery. Sheriff Wilcox also attended and came across four beings (he assumed they were from space) near the burnt area - one was still alive. In later years the sheriffs wife told her granddaughter " Their heads were big and they wore silvery suits". In the early hours of Monday 7th July Col. Blanchard instigated road blocks to a distance of 20 miles - even the sheriffs deputies (Bud Payne, William Woddy and his father) were refused access to the site. Meanwhile Jesse Marcel and his two companions arrived at the site to find the salvage team there . In the early afternoon Glenn Dennis of the Ballard Funeral Home was called by an officer at Roswell AFB enquiring about small hermetically sealed coffins . At 2-00pm a meeting took place at the Pentagon to discuss the "Flying Saucer situation" - present were Gen. Curtiss LeMay (deputy Chief of Staff for R&D of the AAF) and Air Chief of Staff Gen. Hoyt Vandenbury. Following the meeting Gen. Nathan Twining ,Commander of the A.T.I.C., prepared to fly to New Mexico. Around mid-afternoon Glenn Dennis got another call asking how to preserve bodies that have been lying in the desert for some time and what effect the chemicals used would have on the composition of the body. Interestingly Glenn Dennis suggested packing the bodies in ice. By night time most of the debris had been removed and before returning to the base Marcel called home and showed part of the wreckage to his wife and 11year old son. Marcel remarked to his son "This is something very special - it does not come from this Earth - I want you to remember it all your life". The many rumors regarding the flying discs became a reality yesterday when the Intelligence Office of the 509th Bomb Group of the Eighth Air Force ,RAAF, was fortunate enough to gain possession of a disc through the cooperation of a local rancher and the Sheriffs office of Chaves County. The flying object landed on a ranch near Roswell sometime last week. Not having phone facilities , the rancher stored the disc until such time he was able to contact the sheriffs office, who in turn notified Major Jesse Marcel of the 509th Bomb Group Intelligence Office. Action was immediately taken and the disc was picked up at the ranchers home. It was inspected at the RAAF and subsequently loaned by Major Marcel to higher headquarters".